Quincy the Quail and the Mysterious Egg by Barbara Renner is the story of quail parents taking care of their eggs. A horned owl appears and scares the family. Will he harm their nest? Quincy stands tall to protect his family when a huge egg drops from the sky, landing close to the quail family’s home. What should they do? What would you do? They should show kindness and help the egg hatch, of course. In a world that needs more kindness, Barbara Renner uses the story of Quincy and his family to model a way to show kindness, in Quincy the Quail and the Mysterious Egg. Not only does Renner demonstrate the theme of kindness but also that learning is fun. She has included short factual information about quails, owls, and plants around them in the southwest. Would you like to know what sounds a quail makes? What about an owl? You are in luck as a QR code for a Gambel quail and that of a Great Horned Owl are both included. Amanda M. Wells’ colorful illustrations bring the story and the quail family to life for the young reader. I love the illustration where the baby peeks from the shell. 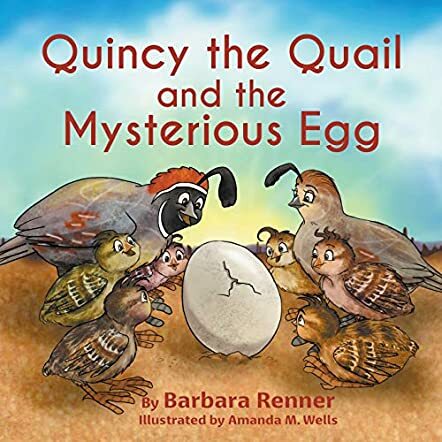 Quincy the Quail and the Mysterious Egg by Barbara Renner is written for young children and is perfect for them with its short length and beautiful illustrations. I highly recommend Quincy’s heartwarming story to adults seeking a simple story for youngsters with the theme of kindness.